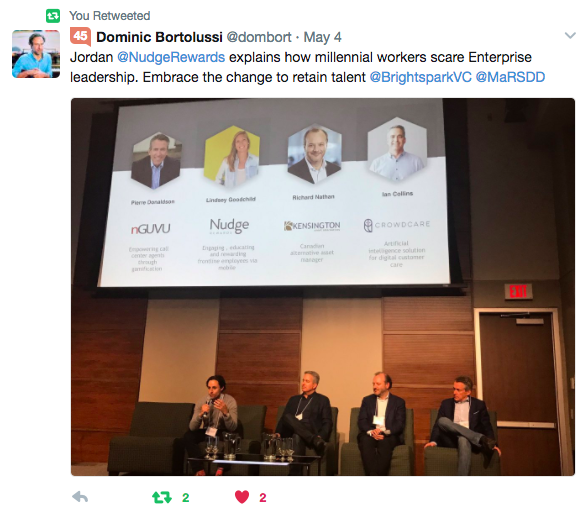 Last week, hundreds of investors and leaders in the Canadian technology industry came together at the Brightspark Investor Summit. Despite the rain, the energy in the MaRS auditorium remained undampened! The panelists - largely CEOs of companies in the Brightspark portfolio - undoubtedly stole the show. Their insights into growing and funding early-stage companies, and their vision of the shifts happening in the market made for panels that sparked some captivating discussion. 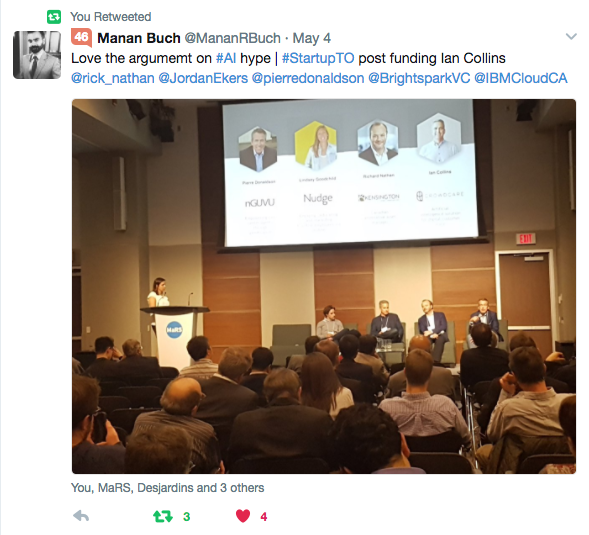 The evening kicked off with Salim Teja (EVP Ventures, MaRS) and Brightspark's Managing Partners, sharing their take on the state of the Canadian tech investment industry. Mark and Sophie spoke about the disruptions that are inevitably making their way in the Canadian market - including emerging funding models, value creation in private markets, and increased individual investor demand for access to venture capital investments. 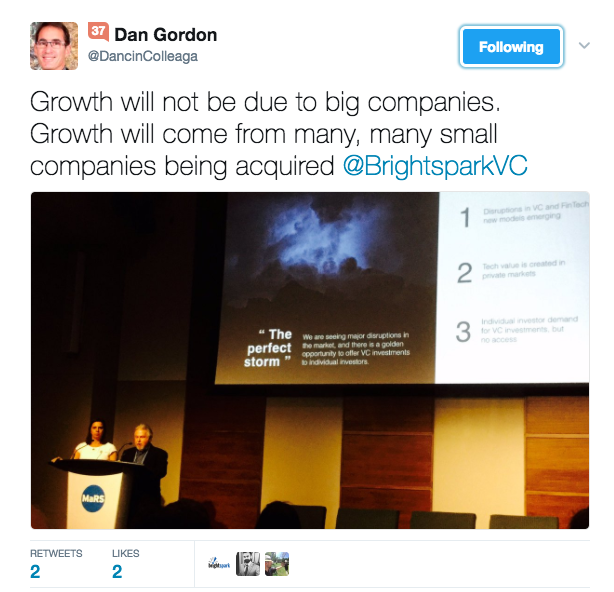 A perfect storm is brewing in the Canadian startup investment space, and Brightspark will be seizing the opportunity to offer individual investors the best VC investments. The first tech panel discussed popular tech buzzwords. When it comes to the "Millennial" generation, Jordan Ekers (CCO, Nudge Rewards) is confident that enterprises will have to embrace the generational behaviour changes and adapt to the needs of this new workforce. Engaging and retaining talent is crucial to any business, and understanding the habits of younger employees should be at the core of every company's strategy. Pierre Donaldson (CEO, nGUVU) echoes Jordan's statement, stating that Millennials are forcing traditional businesses to evolve. Interestingly enough, he adds that in contact centres, most "new" behaviours that are instilled by Millennials shift positively affect employees of all ages. The panel also sparked an interesting debate about the hype surrounding Artificial Intelligence. Ian Collins, the CEO of Wysdom.AI (formerly known as CrowdCare) — an AI solution focused on customer care— has some controversial thoughts. His take is that while artificial intelligence has immense potential to disrupt how we interact with daily life, most AI companies still haven't created solutions that have practical uses in today's world. Only a handful of companies have leveraged AI to produce solutions that have economic advantages, and we're still miles away from reaping the benefits of AI's true potential. One of our panelists also touched on a subject near and dear to our hearts: company culture. 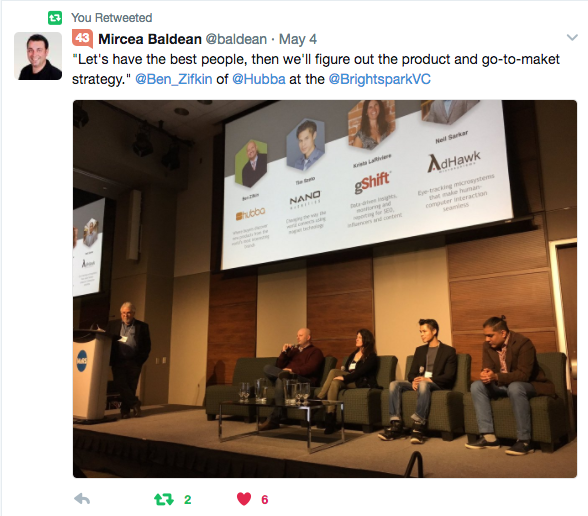 There is much to be envied of Hubba's award-winning culture, and Ben Zifkin's advice is to start with the best people, period. The trick is to not compromise on quality when building your core team, and only then ironing out the product and market strategy. Finally, we were lucky to have Fred Lalonde (CEO of Hopper) join us for a special keynote to share his story. The talk was the highlight for many of our guests, and Fred captivated the audience with his 10-year journey into growing the #1 mobile flight app in North America. He's learned that patience is key, and that hockey stick growth can sometimes sport a verrrry long paddle —as demonstrated below. The closing words of the night, and the ones on everyone's lips during networking was "the importance of diversification". In this new era of startup investing, limitless young companies emerging and looking for funding. Investors can afford to expose themselves to a great amount of deal flow, but should keep learning about what makes a "good deal", good. Being a serious investor in high-risk, high-reward assets such as startups makes much more financial sense when you have a well-balanced portfolio of vetted companies. Join our mailing list to get exclusive invitations to events like this one! Thank you to our event Partners who helped make this a great success: MaRS Discovery District, Platterz & The Red Bench Bakery, and teaBOT.